Description: With the Amusement Park came the introduction of the straight-sided Little People, and it was also the first non-pull-toy oriented Little People set. Its pieces were so well-constructed that many were re-used in other sets, including the cars, boats, and the Choo-Choo Train. The concepts of the rides themselves inspired the #969 Ferris Wheel, the #111 Merry-go-round and the #170 Change-a-Tune Carousel. That's a whole lot of mileage out of one playset! The Amusement Park generally has the highest market value of any Little People play set, ranking above the #909 Play Family Rooms and the Safety School Buses in terms of cost. 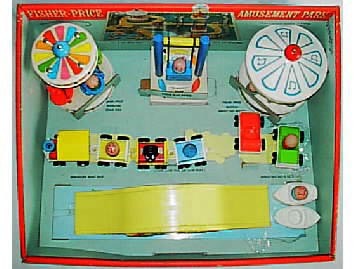 After it was discontinued in 1966, it would be 27 years before Fisher-Price would make a fun park again--albeit in chunky form, 1993's #2560 Little People Fun Park. B932MA - Play Mat - Flat foldable white polyethylene (plastic) play mat with amusement park grounds printed on one side. The printed image has a large green "grassy" area with a yellow roadway and black and white train tracks winding around the mat. The mat has a blue lake with boats and swans for the boat ride, and a roadway from one side of the lake to the other side for the accessory bridge & tunnel. Measures 30" x 30". This version of the mat is STIFF and THICK. *See "Variations" below. FPT233 - Bridge & Tunnel - Yellow plastic roadway ramp that goes up-and-down a "hill". The center of hill has an opening that serves as a roadway car tunnel. Flip the ramp over and it has 2 round people "holes" (one on each end) so the ramp can act as a see-saw or teeter-totter. The ramp has lithographs on both sides of a red brick tunnel and two lithographs on the base (underside) of a brick sidewalk. B932A - Whirling Chair Ride - 4-seat flying chair ride. The ride has a round white wooden base with multi-colored designs on the sides, a tall red wooden support pole in the center, and a round white wooden top canopy with a round blue wooden ball on top that is used to make the ride spin. The top canopy has multi-colored designs on the top and sides. The ride has 4 plastic chairs that face away from the red center pole. The chairs are attached to the top wooden canopy by metal rods. When the knob on top of the canopy is turned, the chairs spin outward, away from the red center pole. The chair colors are red, blue, green and yellow. B932B - Musical Merry-Go-Round - Merry-go-round with a round wooden base and a round white plastic canopy top. There is a round wooden ball on top of the canopy that is used to spin the ride. The base has 4 holes drilled into the top for Little People figure riders. The base has 4 candycane-striped poles that act as supporting poles, they are positioned between each passenger hole. The center of the merry-go-round has a beautifully decorated round cylinder that conceals musical chimes that sing when the ride is turned. Measures 11-3/4" long, 8-3/4" wide, and 8-1/2" tall. B932C - Kiddie Play Swing - This is a 1-seat swing ride that has a square wooden base and 2 round wooden dowels on the sides that hold a top supporting beam. The top beam supports the hanging swing. The seat is made of plastic and is held up by 2 metal rods attached to the top beam. FPT692 - Engine - Small train engine with a red wooden body, a blue wooden smoke-stack, a white plastic base and front grill, and a white peg on the back that any of the 3 cars can hook to. It has a yellow plastic cab roof that tilts back to reveal a seat for a passenger/engineer inside. The engine rolls on 3/4" diameter black plastic wheels that have "Fisher-Price Toys Made In USA" on them.....click here for a photo of the wheels. The wheels are attached with white plastic knobs/axles. FPT701 - Small blue wooden train car with a yellow plastic base and ends. FPT702 - Small red wooden train car with a yellow plastic base and ends. FPT703 - Small yellow wooden train car with a yellow plastic base and ends. FPT877 - Blue top, white base garage style car. This car has TWO metal rivets on the bottom, is marked "fp" and "Fisher-Price Toys" on the TRUNK lid, has NO gas hole, and rolls on black 3/4" dia. wheels that are marked "Fisher-Price Toys Made in USA". The wheels are held on via white plastic axles. No C-hook on back of car. FPT875 - Olive-Green top, white base garage style car. This car has TWO metal rivets on the bottom, is marked "fp" and "Fisher-Price Toys" on the TRUNK lid, has NO gas hole, and rolls on black 3/4" dia. wheels that are marked "Fisher-Price Toys Made in USA". The wheels are held on via white plastic axles. No C-hook on back of car. FPT879 - Red top, white base garage style car. This car has TWO metal rivets on the bottom, is marked "fp" and "Fisher-Price Toys" on the TRUNK lid, has NO gas hole, and rolls on black 3/4" dia. 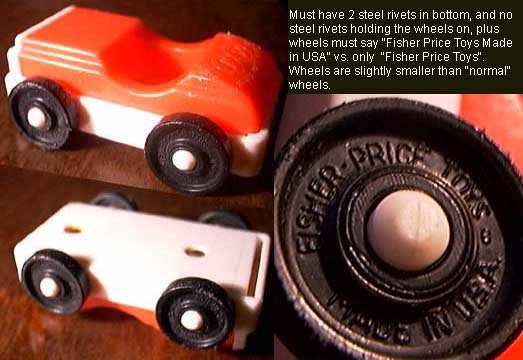 wheels that are marked "Fisher-Price Toys Made in USA". The wheels are held on via white plastic axles. No C-hook on back of car. FPT881 - Yellow top, white base garage style car. This car has TWO metal rivets on the bottom, is marked "fp" and "Fisher-Price Toys" on the TRUNK lid, has NO gas hole, and rolls on black 3/4" dia. wheels that are marked "Fisher-Price Toys Made in USA". The wheels are held on via white plastic axles. No C-hook on back of car. FPT560 - Blue top, white base 1-seat boat. FPT561 - Olive green top, white base 1-seat boat. FPT563 - Red top, white base 1-seat boat. 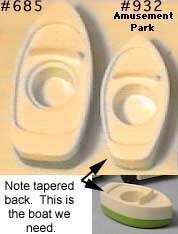 FPT562 - Yellow top, white base 1-seat boat. QWW - 2 each - Light blue boy, smiling, with red heat-stamped hair. *See Variations below. BRWW - 2 each - Green boys with "" eyebrows and red freckles. GKWW - 2 each - Red girl with fancy eyes, red heat-stamped hair, and a red bow heat-stamped on the top of her head. *See "Variations" below. HOWW - Black dog with a pointed face and white droopy ears. This dog was also used in the #719 Fisher-Price Choo-Choo. Although he looks like the dog used in the early version of the #969 Ferris Wheel, this dog is slightly shorter. *See Variations below. B932MB - The play mat was also available in a SOFT and THIN version. BBWW - The blue boys could also have a dark blue body opposed to light blue. PAWW - The girls could also have a mauve body opposed to red. HPWW - Black straight-sided dog with a pointed face and yellow droopy ears. This dog was also used in the #932 Amusement Park. He looks like the dog that was used in the early version of the #969 Ferris Wheel, except this dog is slightly shorter. This set was sold in a 17-3/4" x 13-1/2" x 6-1/2" display box.